Will There Be Anyone Left Who Can Read the Constitution? For some time now, I’ve read that elementary schools have or will soon stop teaching cursive writing to their elementary students and they will only learn manuscript print-style writing. Many reasons are given, such as the use of electronic correspondence, changes in educational standards due to the Common Core State Standard (CCSS), and more simply that in this digital age it is seen as an archaic relic of the past. They say no one writes formal handwritten letters anymore and save for my mother-in-law I suppose that’s true. 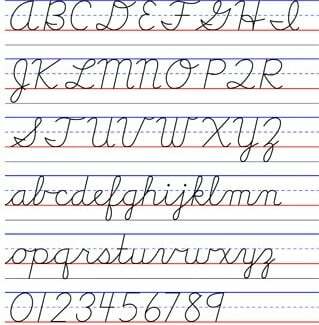 How you write in cursive now is strongly influenced by the method being taught when you were learning to write. 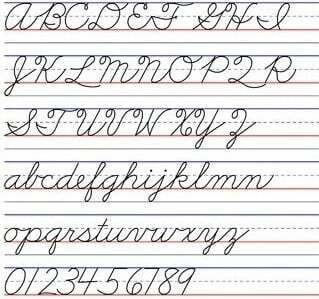 Today, teaching cursive in US schools is on the decline in favor of print and keyboarding skills. Today’s students know QWERTY quite well, but many wouldn’t be able to recognize any of those letters if they were written in older cursive styles. I guess in today’s educational universe, it’s hard to expect kids to sit there and focus on such a task, but I do believe learning cursive helps hone fine motor skills and teaches patience as well as perseverance. especially for business, because it allowed the writer to write very quickly. The Palmer Method is often confused with more modern handwriting methods such as Zaner-Bloser and D’Nealian. Taught in most all schools for the first part of the 20th century, the Palmer Method began to fall out of popularity in the 1950s, and the Palmer Company stopped publishing lesson materials in the 1980s. One of the major reasons for the change was a shift in educational theory that it is easier to teach manuscript (or print-style writing) writing first, and later develop this into cursive writing skills. The Zaner-Bloser method was used first, and then the D’Nealian method was introduced in 1978. D’Nealian is very similar to Zaner-Bloser, and was designed as an even better way to help students transition from manuscript to a cursive style. These are the two most popular methods currently taught to students. While penmanship hasn’t completely disappeared from the curriculum, it is felt that students today should spend their time mastering keyboarding skills than the neat, standardized cursive of their parents and grandparents generations. I’ve seen people take notes with their laptop, but that’s not always practical. I suppose you could even use the Notes App on your iPhone, but again, how fast can you type with your thumbs and still pay attention? One could also print their notes on paper in manuscript, but to me, writing in cursive seems more expedient and efficient and allows you to focus on the speaker. I was taught in the Zaner-Bloser handwriting method. 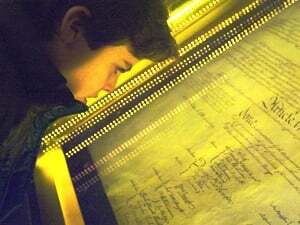 I still have vivid recollections of hours spent practicing my letters in one of those large, lined writing tablets. Mastering the curly loops of the capital E and F were difficult, but the one that caused my blood to run cold was the small case k.
Admittedly, like most people, I have developed my own adapted style of cursive writing so it doesn’t gnaw at me much any longer. My capital letters are less loopy now, and because I’m all grown up and can (reasonably) do whatever I want, I long ago gave up on mastering that small case k … and there’s not a darn thing Miss Monda, my third-grade teacher, can do about it! But How Will They Read the Constitution? But what will the future be like without cursive writing? 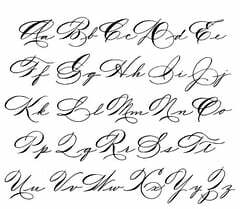 I wonder if someone does not know how to write in cursive, are they able to read documents written in Spencerian and Palmer cursive fonts? In the future, will there be a new subset of translators schooled in the art of interpreting documents written in cursive fonts? Will people be unable to read the Constitution, or documents such as the Bill of Rights, census records, or letters from the past? Some educators say it is quite possible to teach the ability to read cursive without having to learn to write in cursive. I believe there is still a case for continuing to teach cursive along with the other important subjects. But my last thought on this is, if you have not been taught to write in cursive, how will someone sign their name? You don’t print your name, you sign your name, and you sign it in cursive. Printing your name seems sterile and cold, and is something anyone could do on your behalf. You’re often asked for your printed signature on one line and for your signature on a separate line. Think of those times when you have had to put your signature on legal documents. You pause; your pen poised over the line for just a moment. You ready yourself for the moment, and with a flourish, sign your name … in cursive. Unfortunately, I fear we are reverting to the days of “making your mark” when only the educated were skilled (and yes, I consider it a skill) in the art of script writing. Your signature no matter how neat or messy is your brand. It’s your official seal, your John Hancock, and represents your personality; and above all, your personal John Hancock is what makes you completely and uniquely different from all others. Ways to Use a Room Divider - Pictures Are Worth 1000 Words!